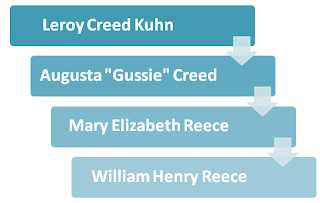 William Henry Reece is my third-great grandfather on my father's paternal side. William was born October 20, 1809 in Tennessee. I have yet to determine where in the state William was born. I have also not been able to conclusively determine his parents. Some online trees have listed his parents as Jesse Reece and Elizabeth Tomlinson, though I am not "documentarily" convinced. By 1836 William was living in Johnson County, Missouri. Again, I have no proof as to when he came to Missouri or why. However, I do believe that he may be connected to two other Reeces in the area: Jesse and Isham. I wrote about William's connection to these men here. William H. Reece married Elizabeth Alexander in Johnson County, Missouri on December 22, 1836. William and Elizabeth lived in Missouri for the next twenty four years. They had five known children. Note that William named two children Jesse and Isham...I don't think this is a coincidence. William is listed as a farmer on each census and I have records that he owned his own land. "William H. and Elizabeth Jane (Betty) Reece lived in Missouri just across the Kansas line. He was a Methodist Preacher and served as a circuit rider. Missouri was the 24th state admitted to the United States, August 10, 1821, a slave state. Rev. Reece did not believe in slavery and preached against it. He was in danger from Confederate soldiers so they moved across the border into Kansas, having traded farms with the father of the Dalton Gang. Kansas was admitted as the 34th state January 24, 1861, a free state. Joseph McCaja Creed was born in North Carolina August 11, 1841 but left while young and was a Union soldier in Missouri. At one time while carrying a message for the Army and was about to be caught, the Reece family hid him and his horse for four days until the other side gave up the search and left. He rode a trained Army horse that went right over the fences. He was a scout for Buffalo Bill on a wagon train. 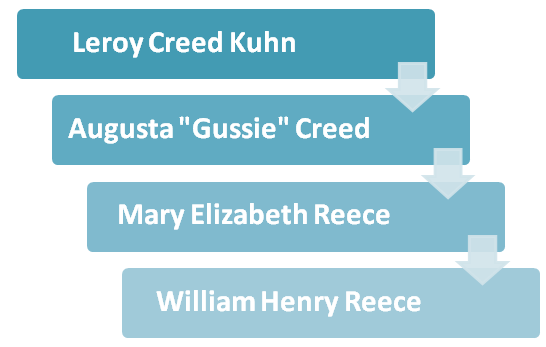 The Reeces had four boys, Redmon, Coleman, Lafayett, and Linton and a daughter Mary Elizabeth. She was 16 and fell for the young soldier. It was him who helped guide the preacher's move." There is no doubt that the family moved from Missouri to Kansas during the Civil War years, but the rest of the above information is yet to be proved. By 1875 William lists his occupation as preacher and does so until the end his life. There are records of him performing marriages in Johnson County, Kansas. William died July 6, 1889 at his home in DeSoto, Kansas. He was 79-years-old. 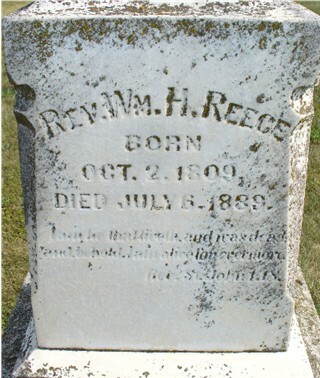 He is buried in DeSoto Cemetery, DeSoto, Kansas. A very short mention of his death is stated in the Lawrence Gazette (Lawrence, Kansas). 1. Try to locate probate records for his "possible" father, Jesse Reece of Johnson County. 2. Try to locate obituaries or biographies for either of his "possible" brothers: Isham and Jesse Reece. 3. Search for probate records for William. - Ancestry.com. Missouri Marriage Records, 1805-2002 [database on-line]. William Henry Reece and Elizabeth Alexander, December 22, 1836. Provo, UT, USA: Ancestry.com Operations, Inc., 2007. Original data: Missouri Marriage Records. Jefferson City, MO, USA: Missouri State Archives. Microfilm.